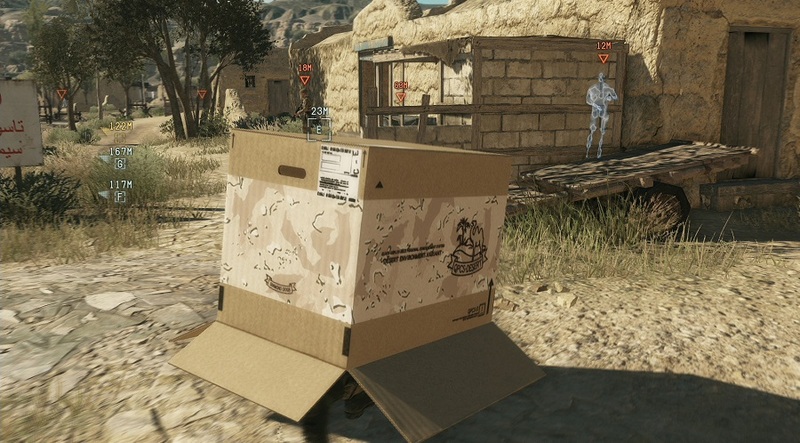 If you’ve played any game in the Metal Gear Solid series, then you’ll know that the cardboard box is a pretty important element when it comes to stealth. Well, that particular element got the spotlight at today’s Gamescom event, where Hideo Kojima went into detail about what the infamous box is now capable of in Metal Gear Solid V: The Phantom Pain. Yes, you read all of that correctly. As I mentioned, the trailer shows off all of the new things that you can do with the cardboard box. You are now able to pop out of the top of the box, fire at an enemy and then hide back inside the box, display various pictures on the exterior to distract enemies, and even jump out of the side to sneak away while the enemies attention is focused on the box. As you can imagine, there is a hell of a lot you can do with this box. Other than that, though, there wasn’t much more to say about Metal Gear Solid V: The Phantom Pain, unfortunately. We know that it’s coming sometime next year, but an exact date is unknown. The game is being developed by Kojima Productions and published by Konami for the PlayStation 3, PlayStation 4, Xbox 360 and Xbox One. Check out the new trailer below. This entry was posted in All, Featured, News, PlayStation 3, PlayStation 4, Xbox 360, Xbox One and tagged Cardboard Box, Hideo Kojima, Metal Gear Solid V: The Phantom Pain on August 12, 2014 by Mike Guarino. We knew for a while that two Assassin’s Creed games would be coming this year, and when Assassin’s Creed Unity was announced for current-generation consoles it was expected that the other game’s announcement wouldn’t be too far behind. However, a lot of time passed and we still didn’t hear one word about this supposed last-gen exclusive. UNTIL NOW! Ubisoft has officially announced that the game that will be coming to PlayStation 3 and Xbox 360 exclusively is none other than Assassin’s Creed Rogue. The game is set in the middle of the 18th century during the 7 Years’ War and you control a Templar named Shay Patrick Cormac. It was developed by Ubisoft Sofia in collaboration with Ubisoft offices in Singapore, Montreal, Quebec, Chengdu, Milan and Bucharest, and completes the saga that started with Assassin’s Creed III and Assassin’s Creed IV: Black Flag. This entry was posted in All, Featured, News, PlayStation 3, Xbox 360 and tagged Assassin's Creed Rogue, Assassin's Creed: Unity, Ubisoft on August 5, 2014 by Mike Guarino. You might not have been aware of it previously, but a heck of a lot of people played the Destiny beta. How many people exactly? Well, according to developer Bungie, they calculated 4,638,937 users playing the game in total. Activision revealed has revealed that this amount of people playing the beta of a brand new franchise is a new record for betas, meaning that Destiny’s success when it releases in September is basically guaranteed. Destiny is set to release on PlayStation 3, PlayStation 4, Xbox 360 and Xbox One on September 9th, 2014. This entry was posted in All, Featured, News, PlayStation 3, PlayStation 4, Xbox 360, Xbox One and tagged Bungie, Destiny on July 30, 2014 by Mike Guarino. Sledgehammer has gone on record saying that their upcoming Call of Duty: Advanced Warfare could really shake up the multiplayer aspect of the Call of Duty franchise. “We’ve got heavy weapons, which is sort of another new class, verticality through the boost jump – you can imagine what that does to the multiplayer experience, and then cloak, super-strength, and then off-the-controller changes, like the exo-boost and the exo-slide. This entry was posted in All, Featured, News, PlayStation 3, PlayStation 4, Xbox 360, Xbox One and tagged Call of Duty: Advanced Warfare on July 25, 2014 by Mike Guarino.